How about a vacation on the beautiful Greek island Crete? 🙂 I just found an amazing deal on Sunweb for you guys. You’ll spend 7 days in Greece at the great 3* Hotel Villa Chryssanthy Sea. Flights are already included in the price of 1.239 kr. Your hotel is located only a 1 minute walk away from the sandy beach of Gouves. Your accommodation has a a furnished balcony and a kitchenette so that you can cook your own meals while in Greece. Villa Chryssanthi Sea offers self-catering units overlooking the Cretan Sea and the swimming pool. There is also a sun terrace available where you can relax. There are many restaurants and bars close to your hotel. On TripAdvisor, Villa Chryssanthy Sea has received good reviews and has been awarded with a 4.5 out of 5 rating from 213 reviews total. The flights are from August – September with Norwegian from Copenhagen to the island of Crete. Click through the link and see if you can find something that fits with your schedule. 🙂 Checked- & hand luggage are included in the price. Relax at the beach, go hiking, explore the landscape or just enjoy the pool area at the hotel! 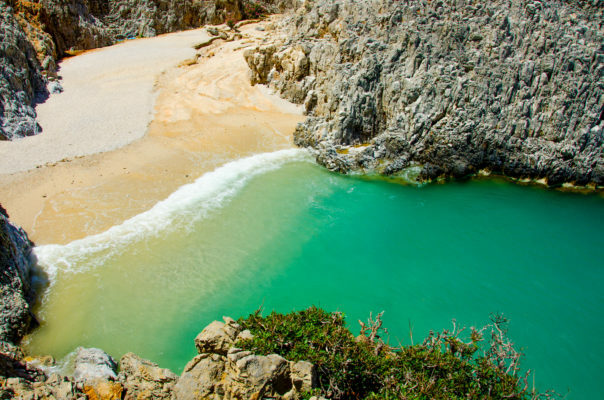 Crete is perfect for summer holidays and known to have the most beautiful beaches and water quality in Greece. For some inspiration check my Crete travel tips article. Let’s go to the Crete deal! Sign up for our Newsletter, and don’t miss anymore deals. You’ll be the first to find out about our Crete bargains!